Despite the fact that these aren't "applicable", or particularly crude, but they do fall into a collectable category. 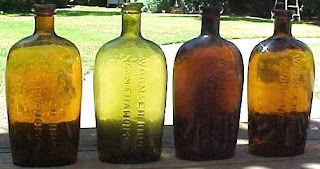 A few pint and half pint Hotaling flasks from up "Orygun" way. My first attempt at posting! Here is a labeled fifth that I have had for a long time. Embossed "CHENERY, SOUTHER & CO. S.F. ", this is the wavy line variant. A fairly rare bottle, but not very desirable due to the limited embossing. 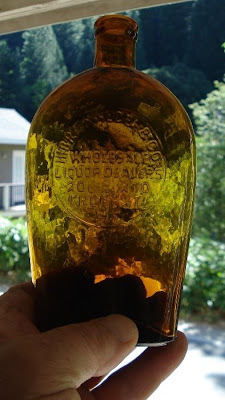 Although produced in the 70's, this bottle is well made and does not exhibit much crudity other than some nice stretch bubbles in the neck and a few other scattered bubbles. What makes this fifth a looker is the nice early label. Unlike the fancy and colorful labels found on some of the later tool top whiskeys, this one is more typical of the early labels found on bottles from the 60's and 70's. 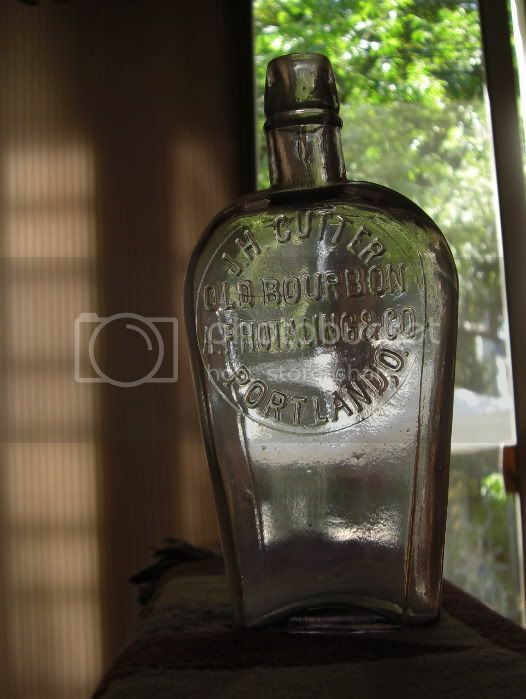 No color on this one, but actually, pretty ornate lettering which reads as follows: "SAFFELL'S / CEDAR RUN / fancy monogram and TRADE MARK / PURE BOURBON / CHENERY, SOUTHER & CO. / SOLE AGENTS S.F." 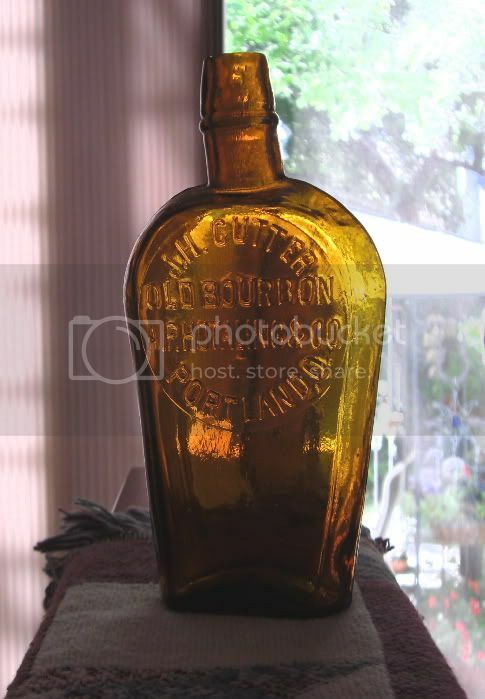 This bottle turned up in a Norm Heckler auction a number of years ago along with a bunch of tooled top western fifths that were all sold in lots of three. Must have been a small collection from the West that was consigned to Hecklers. 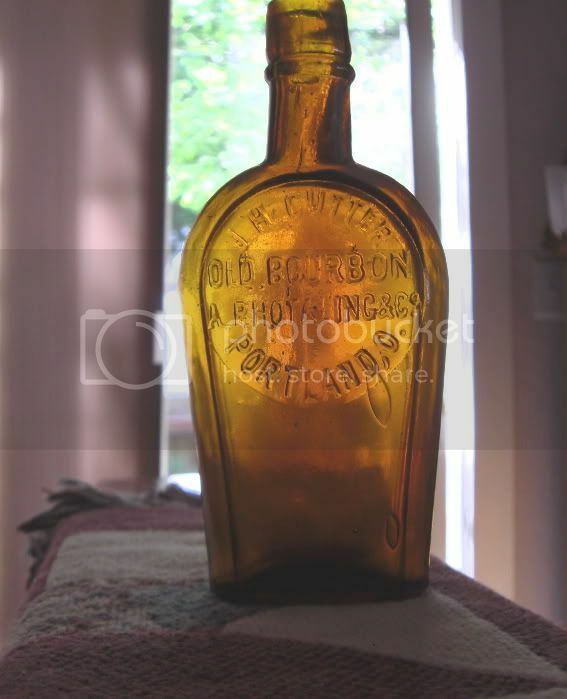 Bob Barnett purchased every lot except the lot that contained this bottle! I have only seen a few of these for sale over the years, in both variants, so who knows about how many of these are in collections? Sorry 'bout the lousy photos! Was not able to rotate them, maybe better luck next time! 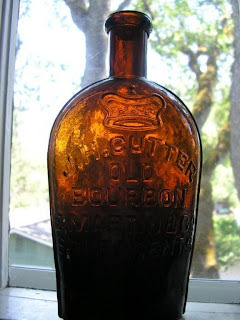 I know this blog is called, "Western Glob Top Whiskies," but I thought those of us who like "picture" fifths, Barrel Cutters, or anything else that's unusual or weird, would still get a kick out of this one (even though this bottle hasn't had it's 100 yr. old birthday just quite yet)! 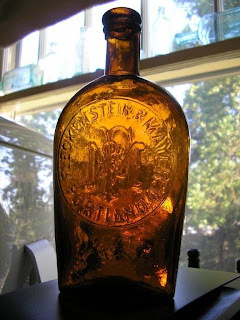 Earlier this year, we unearthed this very unusual Bourbon bottle that must have made it's way across the U.S./Mexico Border just before or perhaps during the era of prohibition in the U.S. (as drinking in Mexico became the "legal out" for any U.S. citizens who wished to keep their habits up to speed). 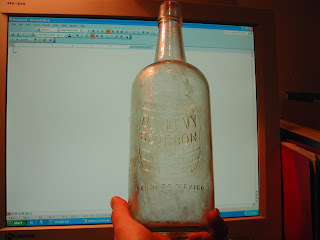 The bottle is machine made, and likely a pre-prohibition fifth from the middle to late teens. Nobody here in San Diego has ever seen or heard of this fifth before. It's a total oddball! 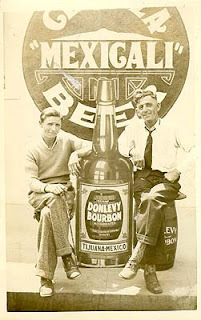 Upon my initial research, I was able to discover an advertisement (taken from an early post card) that proves this bottle to not only be a Mexican fifth, but a fifth that hails from Tijuana, Mexico! How did this fifth travel across the border way back when? Who was the individual that brought it back to drink here in the good ole USA? Are there other whiskey fifths from Mexico? 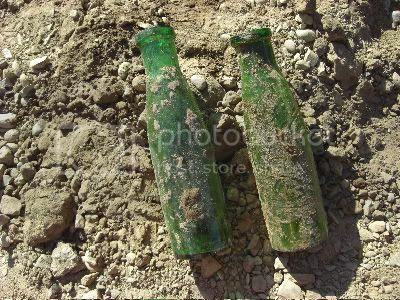 Was this bottle blown somewhere in Mexico? Does it/should it qualify as a "Western" whiskey? After all, Tijuana is the westernmost city in Mexico! Would there be any fifths that were made earlier (tooled or perhaps even applied)? Does that mean there could also be an early fifth that once held Tequila? Jno. C. Cuervo? This little high valley herd of "johnnies and nicks" has been grazing peacefully long enough. Back up the horse trailer Dusty, there's a rodeo in SoCal this weekend. I hear some of the top cowboys are out of action for this one, maybe we can ride on in there and do some serious 'harse tradin'. You No. California boys are pretty lucky, bottle shows every month, flea markets and street fairs, digging all around ya. I can't blame ya for not wanting to head down to Pomino. I live here in Morgan, U-tah, on the other side of the Great Salt Lick. Hail, it's always about 500 miles to the nearest bottle show. Unless I drive up canyon (Park City way) and see the empties in 'ol Dave Bone's window. I surely do miss goin to Reno for the show. Since 1972, I've only missed a couple of those Reno shows. Missin it this year but it ain't my fault. So I guess we'll use that gas money for Pamoana. We'll let you boys in on the go'ins on there in Pamon, Pamoon, Pa-mow-na. Get the map Dusty, we're goin to a different part of the state for a change. Now here is a great flask. I have made mention of the recent find of the A.M. Smith flask from Salt Lake, but I have to admit the Adolf flask is nearly as rare. 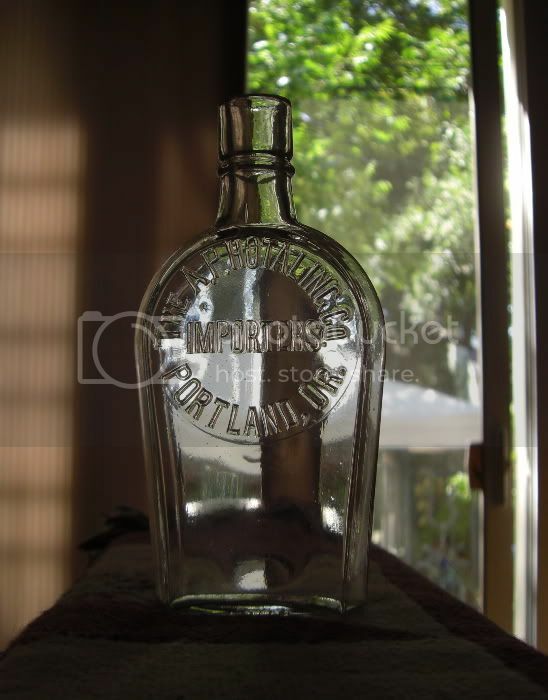 This flask has to be mentioned with the other top Oregon bottles. The S. Adolf Portland O. (tf-1.5) is known in the pint size, 3 examples known. Two applied top and one is tooled. Thomas makes mention of a 1/2 pint tool top, I am not sure if that is correct. Light amber, slug plate mold, knife edge flask. Check out the top on this one, super crude. The owner of this beauty was able to acquire it from a descendant of good 'ol Sam Adolf about 10 years ago. He had to negotiate with the relative for several years before a deal was done. Here is a great run of J.F. Cutter(t-46) fifths that Richard Siri sent in for us to take a look at. That big top or 'fat boy' variant 1 is lighter amber than you usually see them. The greenish ones just speak for themselves! Some smokin' Wormser Bros. Verticals (tf-63). You don't see them in that light green color very often. I have been slow to get to some of the great photos 'Millers Extra' has sent me. I have been a little busy this month and have been a bit derelict in my posting. He calls this one "just another Cutter". Well not quite!! J.H.Cutter Crown Shoulder(tf-10) in dark, chocolate amber and super whittled. Just a beautiful bottle. 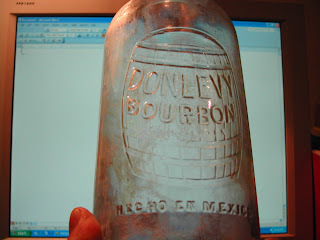 Here's a recent addition to the flask shelf thanks to a Reno Nevada collector that was selling off some of his bottles. 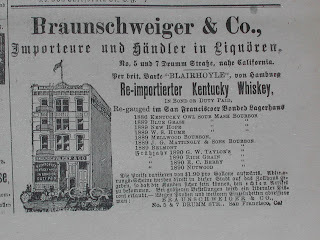 H. Brickwedel & Co. started operating in San Francisco as early as 1859. In 1860 the company moved to 208 - 210 Front Street and remained in business at this location until 1883. 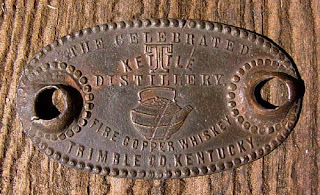 Brickwedel produced a slug plate fifth embossed: OUR CHOICE OLD BOURBON H.BRICKWEDEL & Co 208 & 210 FRONT STREET S.F. SOLE AGENTS. and a pint & half pint flask embossed H. BRICKWEDEL & Co. WHOLESALE LIQUOR DEALERS 208 & 210 FRONT STREET S.F. 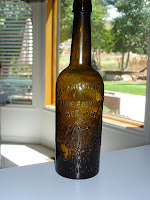 These bottle were produced from 1880 to sometime in 1883. The fifth is considered rare with possibly only a half dozen examples known. The flasks are alot more common then the fifths and come with an applied top and tool top. Here is some reading material for you from A.M. Smith's book. After many trials and failures he landed in Ogden, Utah working for the C.P.R.R. The numerous Mrs. B. Youngs were good customers. Fame and fortune in a big way later on in Minneapolis. The month of June saw a few more globs available for purchase on Ebay. 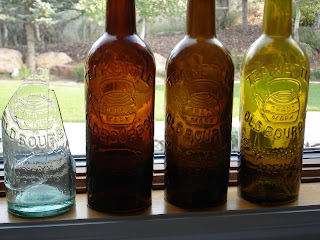 Westernglassaddict had a pair of nice fifths listed and they both found new homes. A mint, yellowish amber McKennas(t-168) not much whittle, but with a good, solid strike sold for 1350.00. It was a good price, and a good example. What else am I going to say, as it now is in my collection! Also a good example of a Hotaling-Portland Crown fifth(t-56) sold for a fairly strong 3028.00. It was also in perfect condition, with a strong strike and in a fairly typical medium amber color. BottleVault had several glob fifths that were sold including a passable O.K. Cutter(t-41) that went for an uninspiring 178.00, also a somewhat weakly embossed Circle-Cutter(t-44) brought a fair 153.00. A W.A. Gaines(t-110 ) was sold for the disappointingly low price of 570.00 and change. The buyer was probably happy, but it's sad to see a nice, classic old glob top get such little respect. To be honest, the picts. 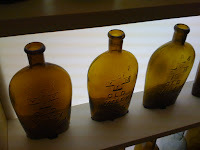 on 'vaults' items seem to be a bit fuzzy, to me anyway, and that Gaines in particular was hard to get a good idea of the character of the bottle. A couple of those fifths may have done better if he had a bit more clarity in those pictures. I'm not sure of his technique, but leisalu's bottles look so sharp on there that they may just roll off my monitor and into my lap. Don't know about you, but if I'm buying something on fleabay, I need all the encouragement I can get.... guess that starts with the photos. Sorry, it sounds like I am beating on bottlevault maybe a bit too much. He provides a tremendous amount of inventory for collectors to consider, that takes a lot of time and effort ... and picture posting. Globtop has been a familiar name on the 'bay the past few years. He has posted some nice pictures as background to some of his listed items. Appears to have built one heck of a collection up there in Alaska. The Spruance,Stanley fifth(t-145) he just sold should have brought more than 160.00. Needed some "extenze for bottles" or something to lengthen the neck on that spud. Nothing in the way of auctions to speak of. 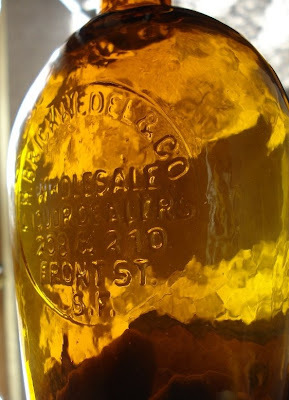 The glob top whiskey world is waiting for the August installment of American Bottle Auctions. The California Clubhouse Pure Bourbon(t-119) is certainly a hot topic right now and probably right up to 'hammer time'. Pro or con, numero uno or not, where ever you weigh in on the Cal-Club it will be an excellent opportunity to view, and even hold, one of the great western fifths at the National Show in Pomona. Should be fun, lots of bottles change hands in room sales. I'll have a spread there, nothing killer, but look forward to seeing everyone. ------- Jno. C. Morrison Jr. Rumors have been confirmed!! 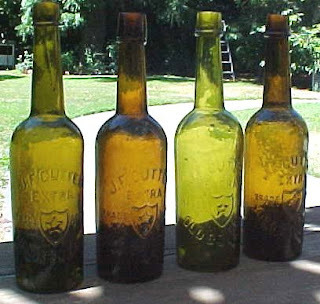 I just received the Auction #48 promotional e-mail from American Bottle Auctions and yes a California Clubhouse will be in the auction scheduled to begin sometime in August. I think this is the first Clubhouse to sell at public auction, all other examples have changed hands privately. Other heavy weight bottles have changed hands recently and this is usually a good thing for the hobby... sometimes a trickle down occurs as cash is raised to buy the heavy!! Be prepared, there may be something come available that you have been looking for. 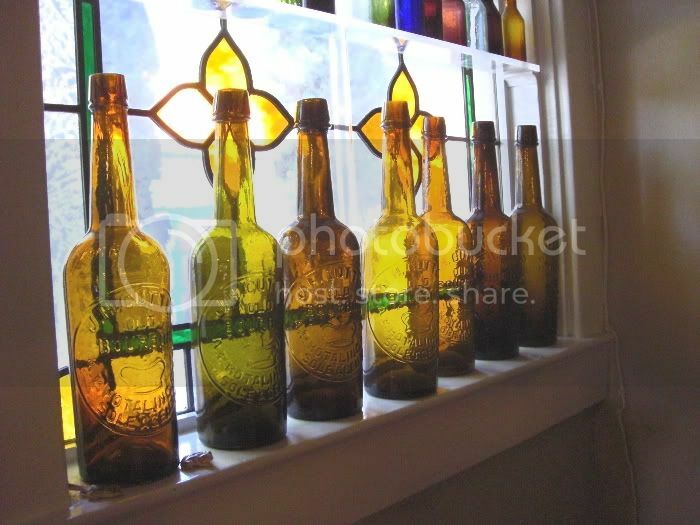 Super that Jeff is going to have the bottles available to view at the National Show in Pomona. If you were thinking of skipping the National for what ever reason, that might be a mistake. ...and hand grenades, but not when digging bottles. A privy a buddy and I dug Sunday afternoon played out just that way. 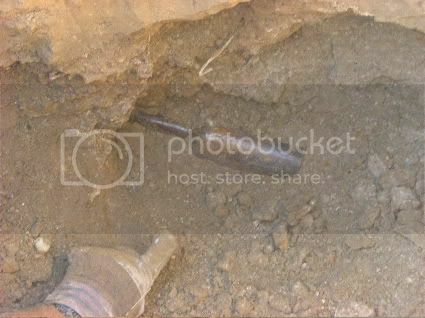 It was late pit that had been dug into and largely destroyed a much earlier one. We had plowed down about three feet and found nothing more than TOC crap. I was hating the situation, but since we were already there, we tried to make the best of it. I was cleaning out one end of the pit when I discovered a broken SF Gaslight Ammonia. Hmm, what have we here? That sure didn't belong in the 1900s hole. More investigation turned up a busted late '60s square sixth bitters type, unembossed, but a killer color. Sure enough, the remnants of an older pit were there. The newer one had transected 75% of the "proper" one, lunching all the goodies in the process. Forgetting the "crapper", we went for the "gold". It began to show, too. Here was a globby fifth, laying in the fluff. The heart rate was up considerably as the bottle was carefully removed from it's place. Major bummer, it was a bloody "generic". Crude dog, but useless to me. Finishing the remains of the privy netted us one more star based fifth, a few early pharmacies, and a dozen slicks. No killers to talk about. About the best glass in the hole were these two wannabe Codes. Bright green, crude, but slickers all the way. ...are in everyone's collection. No globby grouping would be complete without at least one of them. They come in every shade of amber, from deep chocolate to greenish, and can vary in crudity just as well as more desireable Western fifths. 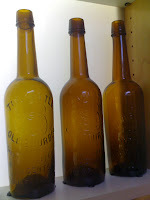 Long derided as "common" and not too collectible, these bottles have risen in value and now command a bit of long deserved respect. 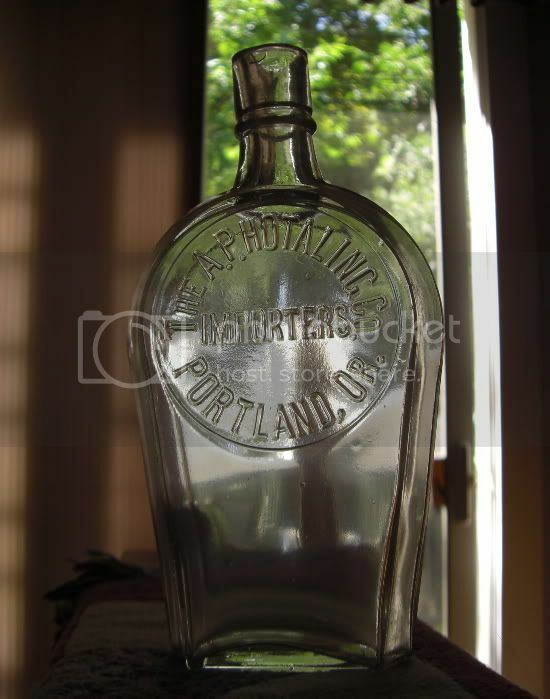 One of the prettiest and most popular of the early glob top western flasks is the AAA OLD VALLEY WHISKEY(tf-1). An early flask, and a container that was used for a good long time. 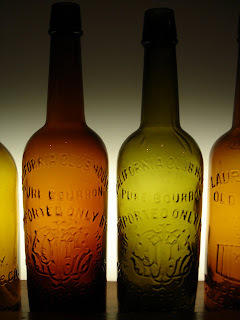 They come in numerous colors and shades and are almost always quite crude, either with whittle or that squashed appearance in the body near the word whiskey. All known "Triple A" flasks have a single roll, crudely applied glob top. There are probably 100+ known examples of the AAA flask, but like the Teakettle fifth, collectors love this bottle and the price just keeps escalating. Here is a nice set from Larry Westfall. Mirror, Mirror on the wall... Who's the greenest of them all! A.P. finally shook loose with a couple of pictures of his 'heavily watered' old valley.